In the summer of 1972, five-year-old Adrien McNaughton disappeared one night without a trace, over four decades ago. Today he would be 49 years old. The tragedy still haunts his family and the town of Arnprior, Ontario. 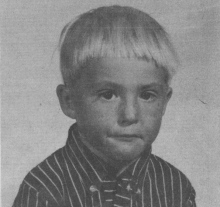 David Ridgen grew up in the same area as little Adrien McNaughton and was a young boy at the time of the disappearance. Ridgen is the host, writer and producer of a new CBC podcast called Someone Knows Something that hopes to shed light on the cold case. Vanished 40 years ago: what happened to 5 year old Adrien McNaughton? Were there any people wandering around, attempting to pick up little children? This is a long time ago, so what were you doing back then? How old were you at that time? Maybe you know something, you did not realize you knew. If you know of anyone in this area let them know about this. They may know something or had seen something. Maybe they might be able to answer some of the above questions. To this day this little boy has not been found. This is a parents worst nightmare. Help find this little boy. The more people looking and asking questions the better. Wouldn’t you want to know? How Corruption has creeped into our World. The next big thing in autos: a hand-cranked hybrid? Hemp What can it be used for. Convention against Torture and Other Cruel, Inhuman or Degrading Treatment or Punishment. "Do you remember killing me, my friend? Israelis torturing non-Jewish children. 2014 Australian documentary film. Gaza War ? : Natural Gas valued at over $4 billion MAYBE? Plastic is killing us and our wild life. Henry Kissinger or CODEPINK: Who’s the “Low Life Scum”? Do Ukrainians Want War? NO!